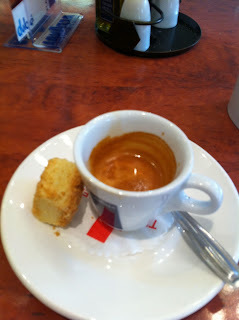 The Frenchman's Food & Wine Blog: Good coffee in Africa - an oxymoron no more! One of the things we take for granted in Australia is the easy availability of great coffee. Well, after spending a few weeks in Africa, I no longer take it for granted! Man it is seriously hard to find good coffee here. I mean espresso. How it was meant to be. Even though some of the best beans in the world come from the African continent, there is a serious dearth of good baristas. At best, you have to hope that they have an automatic espresso machine (there are a few Saecos and even Juras lurking in the back of the more upmarket cafes). And even then, the mentality seems to be more is better, so they tweak the settings so that it fills up your espresso cup to the brim ... and over-extract the poor coffee in the process. Or if they do have a proper machine, they don't use enough grounds in the filter basket ... and over-extract as well. Or use beans that are many weeks, even months, old ... and over-extract. After having to make do with filter coffee (no I will not drink the instant stuff) for so long that I almost gave up drinking coffee altogether, I made a very pleasant and unexpected discovery (those are always the best, aren't they?). I was having a wander around in the Maerua Mall at Windhoek, in Namibia, when I decided that I really needed an espresso, and decided to take a chance. Enter Dulce, a casual cafe just up the escalator on Level 1, across from the Home store. I saw that they had a proper barista's machine. Could it be? No I wouldn't sadistically (or masochistically, in this case) raise my own hopes only to have them cruelly dashed on a cup of weak, thin, liquid vaguely resembing coffee. Perhaps it was the fact that I have suffered deprivation for so long and couldn't tell the difference, but wow - this was good stuff. Nice thick crema, lacking the bitterness of over-extraction, and smelling great! The beans were still older than I would have liked - there wasn't that fresh, fruity citrus undertone that I have come to love and enjoy. But relatively speaking, this was bloody good! It was so good I gratefully left a tip that was more than the cost of the coffee!